It is in and through their contemplative traditions that distinctions between religions begin to dissolve. 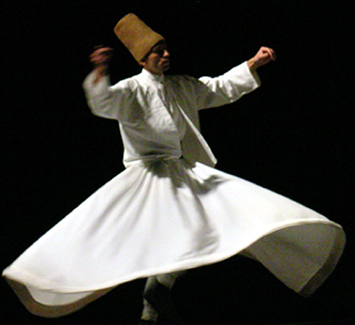 Sufis are the great mystics of Islam, and Hinduism includes manifold contemplative traditions. The 13th- and 14th-century Persian poetry of Rumi and Hafiz and the 15th-century poetry of Kabir from oral traditions in various dialects of Hindi all translate into English as free verse. It is no wonder that teachers from a variety of faith traditions make reference to this body of work. It holds a mirror to what is common among meditative practices of all faiths. These poems have held rich significance for me as I participated in Buddhist practice and found my way to meaningful engagement with Christianity. My one poor effort at religious verse can be found HERE.